What Happened to Harvard Square's Music Scene? 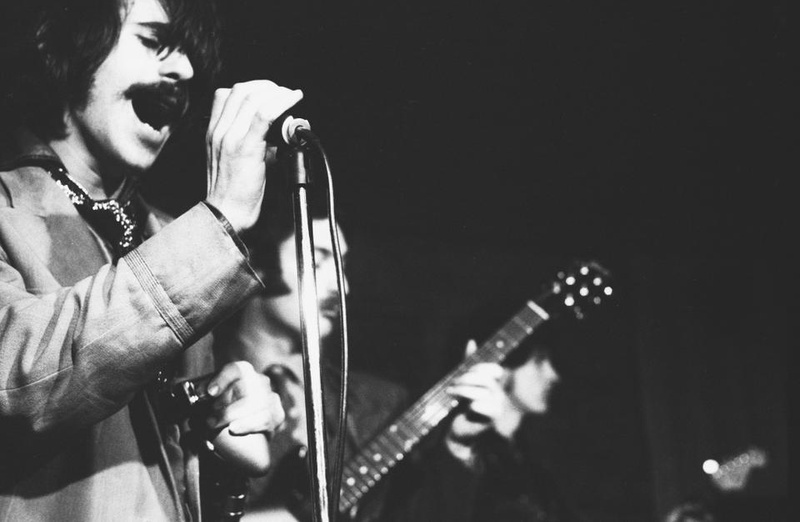 Lead singer Pete Wolf of the Hallucinations performs at Club 47 in March 1968. Performers often used Wolf’s apartment in the Square as a dressing room, since the club did not have its own at the time. “I always thought of Harvard Square in the ’60s as like Paris in the ’20s,” says Steve R. Nelson, co-founder of the Music Museum of New England. Instead of novels and poetry, the Square’s dominant art form was music; its Stein and Hemingway were folk legends Joan Baez and Jim Kweskin. The ’50s and ’60s saw Harvard Square at the core of a massive folk revival, a musical movement that largely began with a ragtag group of college students from Boston and ultimately became a nationwide phenomenon. The Square today, however, is a different story. Coffeehouses and clubs are now overshadowed by Grafton Group restaurants and clothing boutiques, as the Square has transformed from a hotbed of culture to an outdoor shopping center. Instead of going to music joints, Harvard students mostly stick to campus events. But hidden behind the towering Coop and CVS, music in the Square lives on, continuing the trajectory that began with the folk revival. The Harvard Square music scene may be hidden to some, but for music fans with enough dedication and interest, it’s subtly still making history. In the late ’50s, Boston was a thriving college town, and the melting pot of students in the area helped spark the folk music boom. “There were a lot of kids who came to [Boston University] that already were playing an instrument,” says Betsy M. Siggins, founder of the New England Folk Music Archives and a freshman at Boston University in 1958. Siggins was closely involved in the folk music scene; in fact, her earliest friends and roommates included Baez and Kweskin. In 1959, her eventual husband, Bob Siggins ’60, formed the Charles River Valley Boys, one of the era’s most successful roots music bands, composed of several Harvard and MIT students. Folk music in the Square exploded in 1958 with the opening of Club 47. At 47 Mt. Auburn St., where Daedalus restaurant and Cambridge Cleaners sit today, the club became a hub for local and national artists seeking a place to play and interact with lovers of the music. The venue was called a “club” because it charged a one-dollar “member’s fee” at the door, and the operations of the club were a true team effort. “I did everything at Club 47, as we all did. Whatever needed doing, somebody just did it,” says Betsy Siggins, who moved to Club 47 from her previous job as a café waitress. “We put most [visiting musicians] up in our houses because we had no money for hotels.” Even the musicians pitched in; Peter Wolf, who would make his name as the J. Geils Band’s lead singer, was a club regular in the late ‘60s and lent his apartment out as a dressing room for club performers. Bill G. Nowlin, founder of Cambridge roots label Rounder Records, says that Harvard Square’s easy accessibility from a variety of colleges set it apart as a popular destination for musicians and listeners alike. Nowlin was a music-loving Tufts student in those days, and he would often trek down to Cambridge multiple nights a week to enjoy shows at Club 47. “[The club was] not forbidding,” he says. Its grassroots character allowed cash-strapped college students to make live music a part of their weekly routines. The club’s beginnings coincided with national trends. Across the country, college campuses were becoming key to protests and other social movements. For students in Boston seeking mediums for activism, the Square and its performance venues were a perfect fit. “[The Square] was one of those epicenters of this cultural explosion that was going on,” Nelson says. The club also capitalized on the rising popularity of authentic American roots music across the country. Club 47 set up a system with the Newport Folk Festival: the festival would book Southern artists, and to make the trips more lucrative the artists would play two shows—one at the festival and one at Club 47. In later years, many visiting artists at the club veered away from folk towards blues and R&B; Nelson remembers seeing artists like Muddy Waters and Mississippi John Hurt on the lineup alongside acoustic songsters. While Club 47 was the center of the Cambridge scene, it certainly wasn’t all of it. Tulla’s Coffee Grinder on Mt. 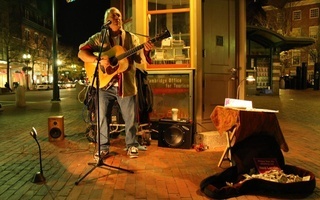 Auburn St.—an early venue for Baez, though now closed—and Nameless Coffeehouse, still residing on Church St. were among the many venues into which local folk musicians, blues singers, and singer-songwriters spilled. The scene was sprawling but low-key, perhaps the perfect combination for young up-and-comers. “[Bob] Dylan was playing in Boston for $2.50 a ticket, and I don’t mean $250,” Betsy Siggins says. In fact, Club 47 once refused the future superstar a booking, allowing the then-unknown artist to play only during another performer’s intermission. Dylan only spent a short time in Cambridge, but he stands nevertheless among the many musicians—such as Pete Seeger and Joni Mitchell—who rocketed from the Square to stardom. The folk renaissance began to quiet as the ’60s drew to a close. The spotlight shifted away from the Square as bands like the Modern Lovers—featuring Harvard students Ernie Brooks ’71 on bass and Jerry Harrison ’71 on keys—found new homes at clubs like the South End’s Boston Tea Party, which Nelson managed for a time. These groups took their cues from the Velvet Underground rather than folk and blues-rock, and it was in Boston’s rock clubs rather than Cambridge’s coffeehouses that they began contributing to the punk movement. But music in Harvard Square far from faded away. Venues came and went, including the original House of Blues, which opened in 1992 but moved to a bigger location near Fenway in 2003. 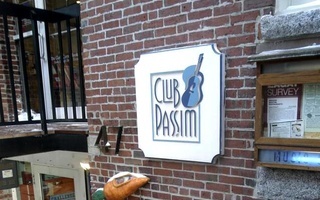 Club 47, after moving to a Palmer St. basement and being shut down by the police, was reopened as Club Passim in 1969. Live music can be found at various restaurants in Cambridge, and upscale jazz has a home at the Charles Hotel’s Regattabar, but Passim is still a focal point for folk, blues, rock and more, sharing this position—as of December 2012—with the Square’s newest music venue, the Sinclair. Though they are located just a few blocks down Church Street from each other, Passim and the Sinclair seem worlds apart. Passim was built from the ground up by locals, while the Sinclair is just one of many venues operated by New York’s Bowery Presents organization. While Passim is a 100-seat basement with unclothed tables and vegetarian food—the club doubles as the dining room for Veggie Planet during the day—the Sinclair is a 500-capacity standing-room rock club with a gourmet restaurant added on next door. It is, in fact, these drastic differences that keep the two clubs from butting heads. Passim sets itself apart by tapping into the rich, local tapestry of genres available in Cambridge. “Boston is not really known as a music city…the way Nashville is or Austin is,” says Dan B. Hogan, executive director of Passim. “[The scene is] so eclectic…. we don’t have a label here, and we don’t produce music here, but we have musicians here of all sorts.” Indeed, Boston may not be pumping out hit singles, but the New England Conservatory, Berklee College of Music, and the cornucopia of schools in town are constantly turning out young artists with a variety of musical interests. 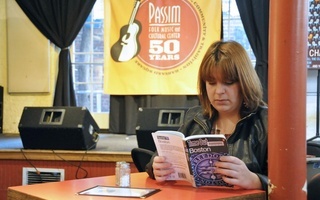 A larger phenomenon may be enforcing Passim’s pull—people are interested in acoustic music again. Recent years have seen folk-inspired bands like Mumford & Sons, the Lumineers, the Avett Brothers, and more rise to an international stage. To some, this is a distasteful trend. “There’s going to be a backlash,” Smith says, referring to “purists” who normally enjoy folk music but might be turned off by said bands’ mainstream success.